Only two weeks left to get your tickets! On April 7th, 2017, #HitchedMTL will host the wedding of the year and only a select number of Montreal’s newly-engaged couples will attend. Designed by Baccino Events, Bravo Rentals and Deka Events, #HitchedMTL will show couples what goes on behind the scenes by creating three mock weddings. 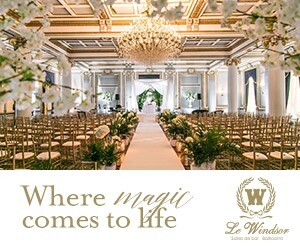 This one-of-a-kind real wedding experience will not only demonstrate three distinct styles present in the wedding industry today, it will allow you to see vendors do what they do best in a setting they are familiar with: A WEDDING! Couples will be selected based on an application and screening process to ensure they are qualified new couples on the hunt for quality vendors. As for the admission, all profits will be donated to the Montreal Children’s Hospital Foundation. Don’t miss out on this unique event Friday, April 7th, 2017, at Parc Jean Drapeau’s La Pavillon de la Jamaique and La Toundra! All couples will also get a complimentary copy of the Elegant Wedding latest magazine.